QUIZ: Can you name all 22 players from the last Scotland squad to compete at a World Cup? 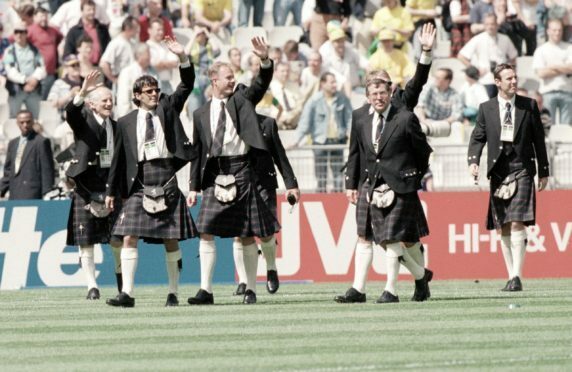 Scotland parade in their kilts prior to kick off. It has been 20 long years since Scotland’s last appearance at a major finals. There has been plenty of heartbreak for the Tartan Army since then, with qualification agonisingly falling out of their grasp on each occasion. It was a different story back in 1998 when Scotland were making their sixth finals appearance in the last seven tournaments. On June 10, 1998, 20 years ago today, Scotland opened France 98 with a hard-fought 2-1 defeat at the hands of the reigning world champions Brazil. A 1-1 draw with Norway was followed by a disappointing 3-0 reverse against Morocco to send the Scots home empty-handed. We may not have had the household names of Brazil but let’s see how many of Craig Brown’s 22 man squad you can remember by taking our quiz below.